From October 2017, Nemo 1 is a brand-new purpose-built diving liveaboard with a steel hull. 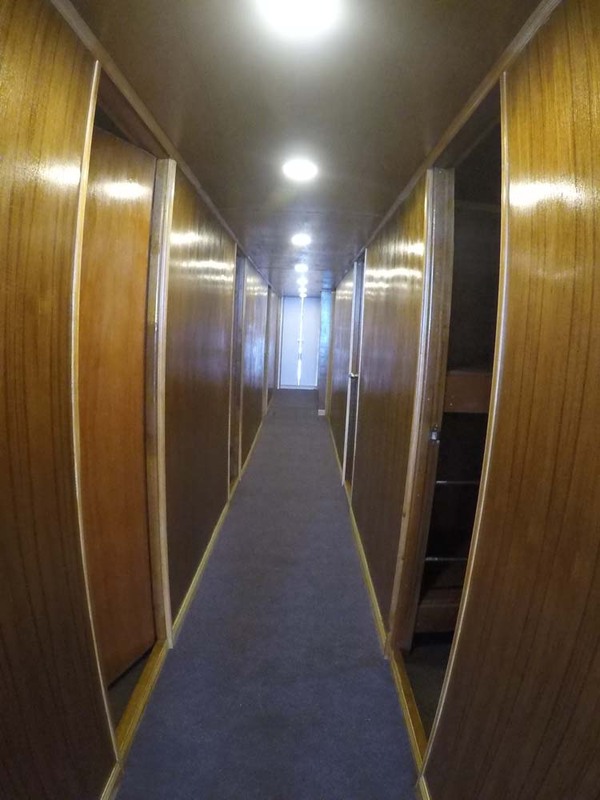 At 27m in length and 5.5m wide, it is easily big enough to accommodate its capacity of 20 overnight guests as well as sail through any rough seas that may be encountered. 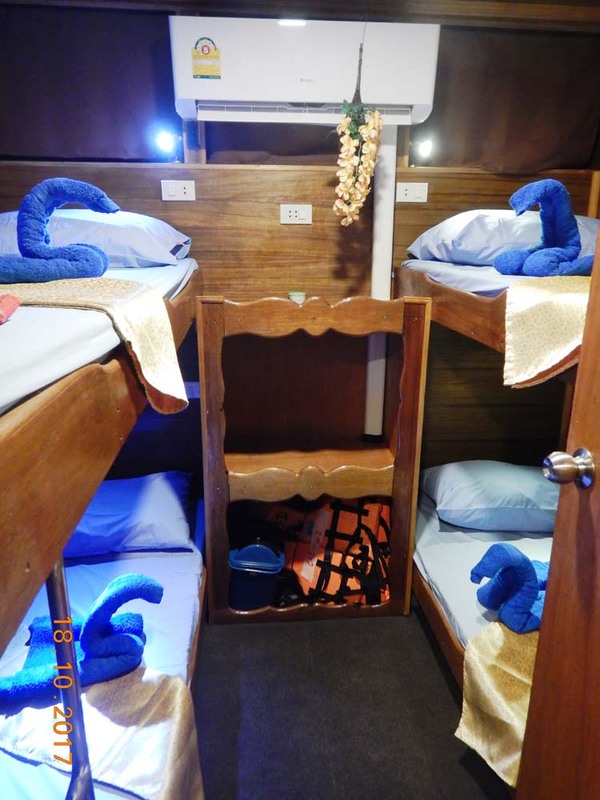 There are two types of cabin; four bunk & double bed. 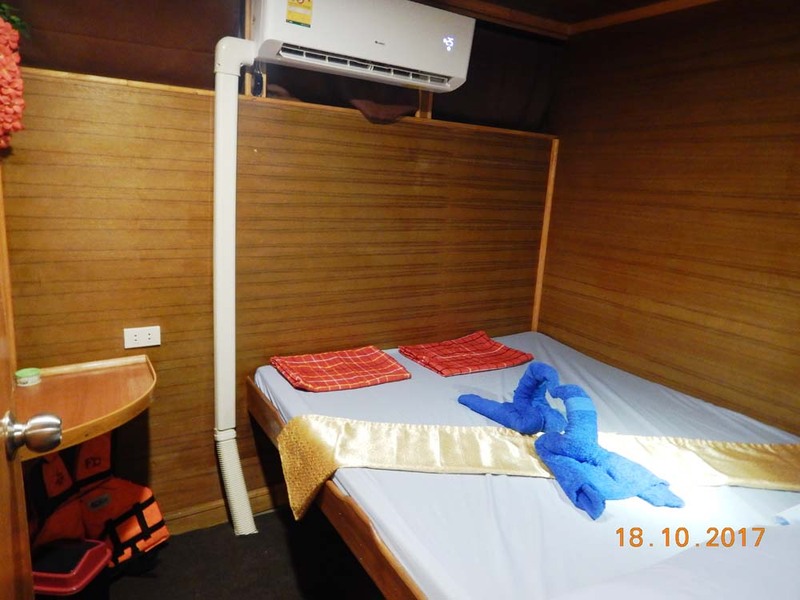 All are air-conditioned, clean and ensure a good night’s sleep. 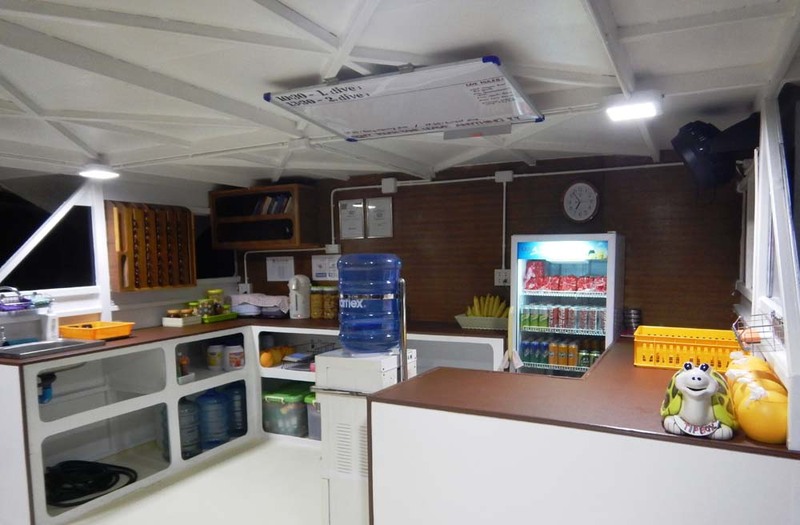 In addition, there is a large covered outdoor dining area as well as a small lounge saloon that is air conditioned. 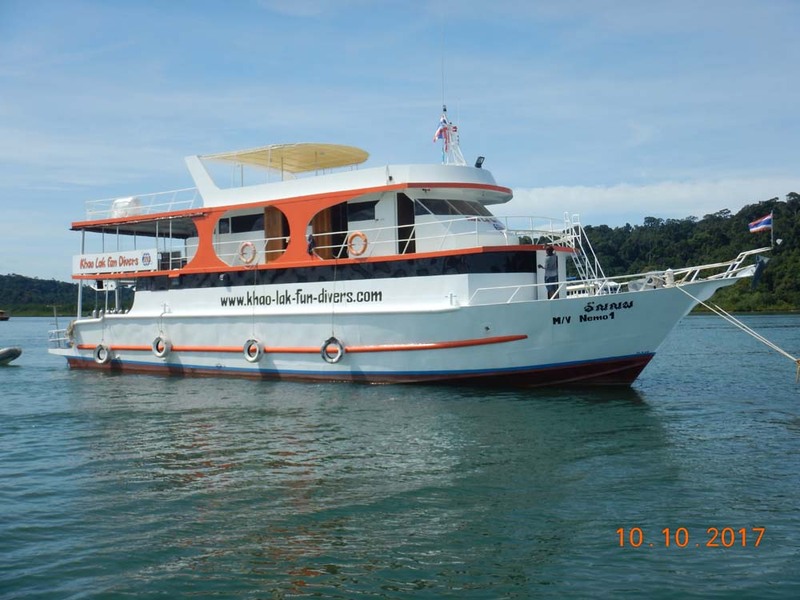 Nemo 1 is known as a 'platform' or 'flexible' liveaboard diving boat. This is in reference to its trips, and not the actual boat. 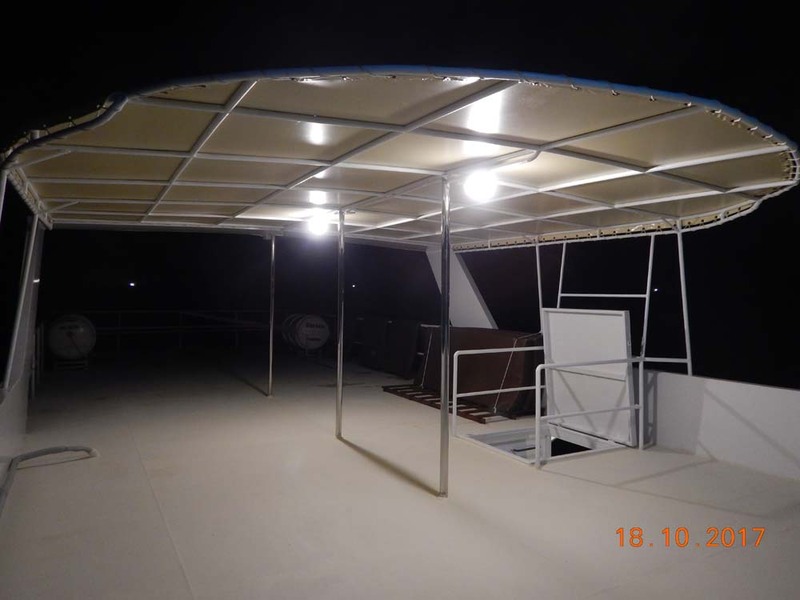 Unlike most scheduled liveaboard trips, which normally sail out in the evening and return to port a few days later, platform boats stay out at sea all season. 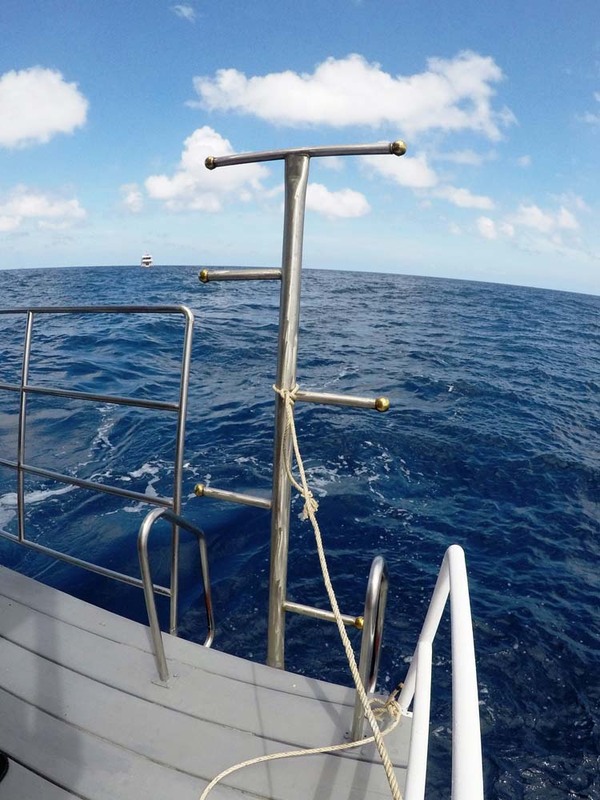 Divers are taken to the ship by speedboat in the morning of their first day, and they stay on Nemo 1 for one night, two nights or even three nights. 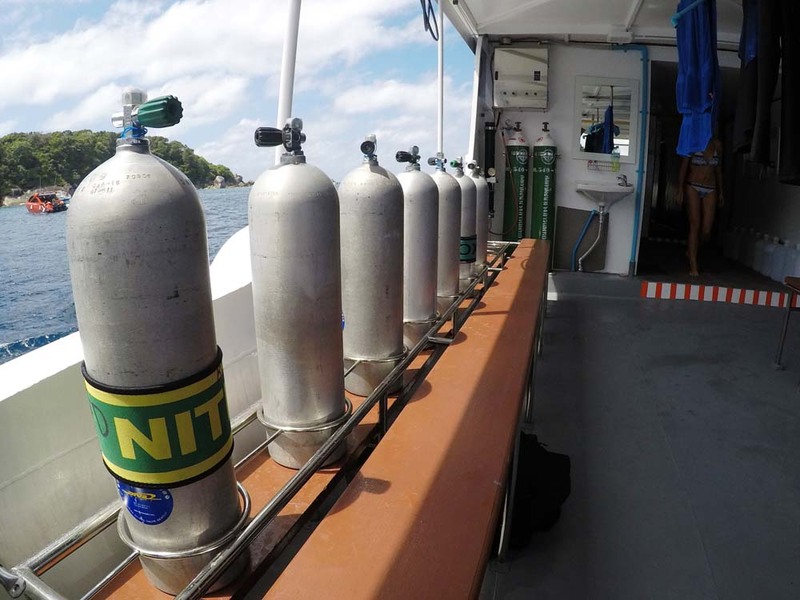 This system means that you can easily fit in a liveaboard diving trip to fit your holiday schedule. Nemo 1 does not stay in one place. 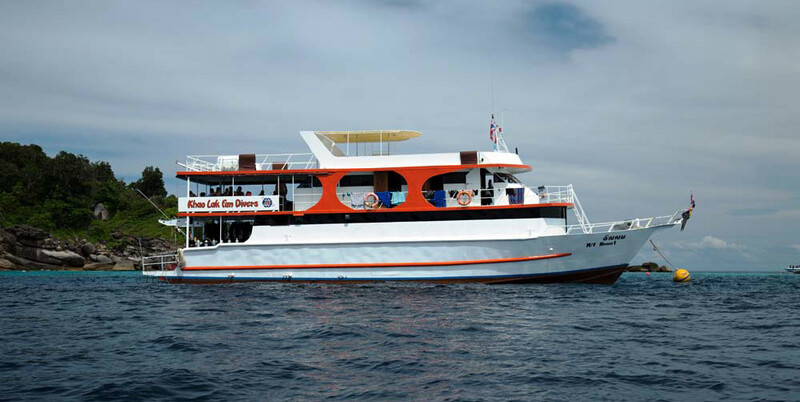 The boat has a weekly itinerary that visits more than 20 different diving sites. Only the very best dive spots are repeated. 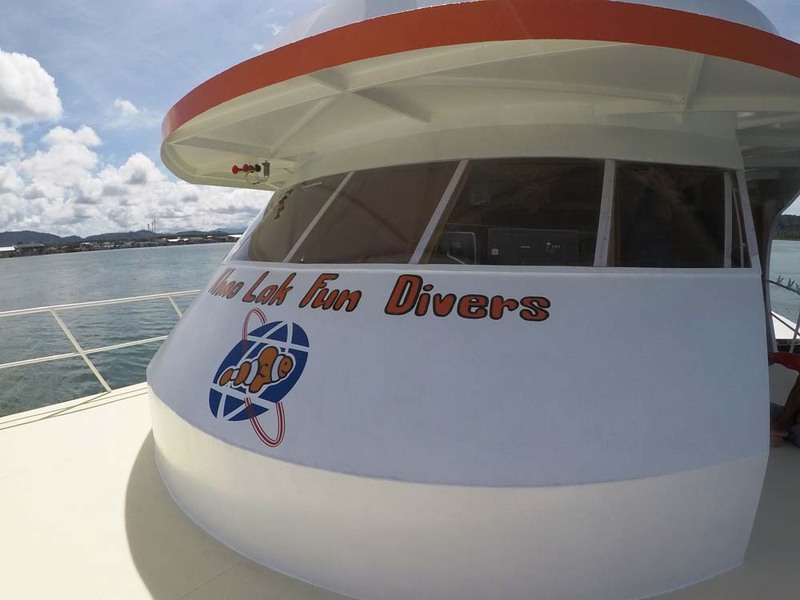 What makes diving from MV Nemo 1 so special is hard to define. 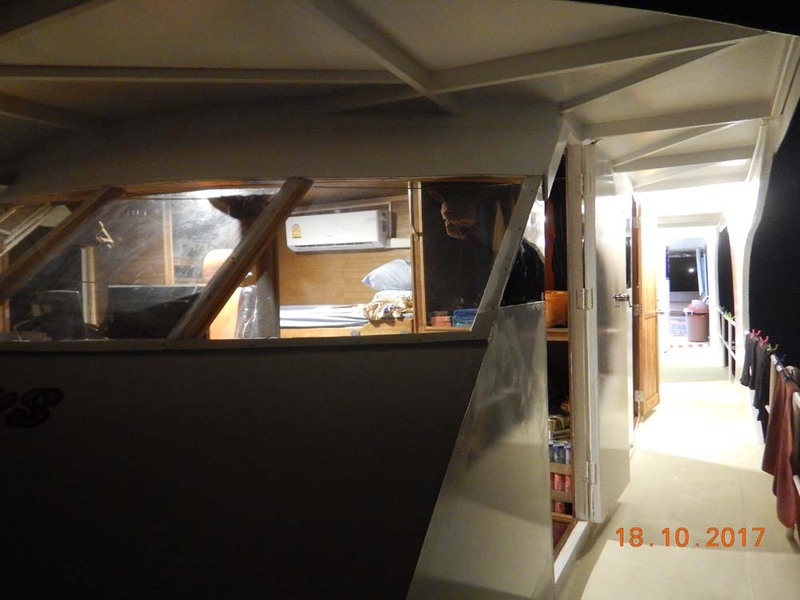 Firstly, the pickups in the morning are guaranteed to be on time, ensuring that the speedboat leaves as scheduled and nobody is kept waiting. Dive guides and instructors are all professional and helpful, and can speak several languages. The food is delicious and plentiful and the small dive groups enjoy carefully-chosen locations under the sea. An extremely experienced Swiss couple own and run the company. 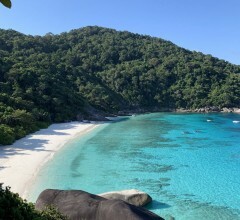 They use their years of diving at The Similan Islands, Koh Bon & Koh Tachai to know what guests want, need & deserve. Everything runs just like a Swiss watch, and diving and snorkelling guests can relax and enjoy excellent trips. PADI courses are available on request. Please note that overnight divers on Nemo are required to dive with a dive computer. Those who don't have their own are able to hire them for a reasonable price. Please carefully check the itinerary that matches your chosen trip. Nemo has several itineraries, depending on which day of the week you join. 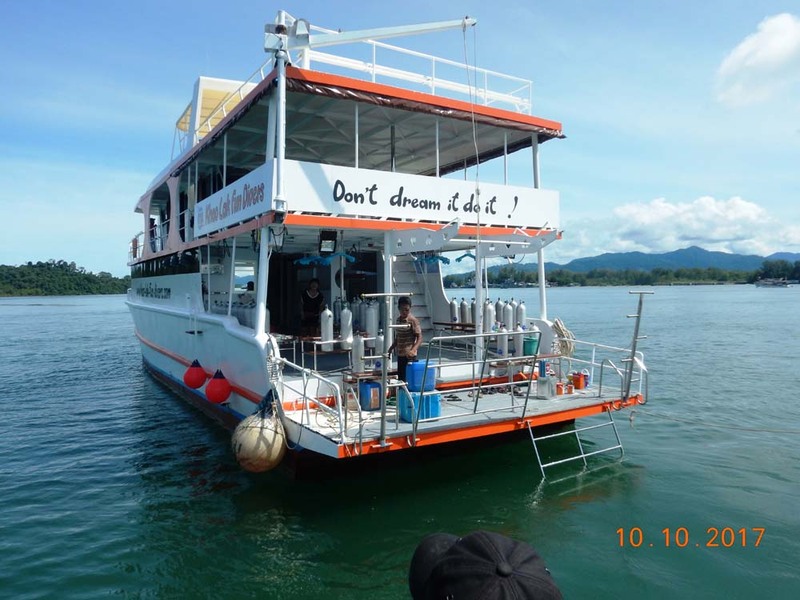 All trips start with pick up from Khao Lak hotels (6.45-7.45am) and 8.00am departure by speedboat from Tab Lamu Pier, Khao Lak, Phang Nga. Return to Tab Lamu Pier on your final day is at 4.45pm, and everyone is taken back to their chosen destinations around Khao Lak. 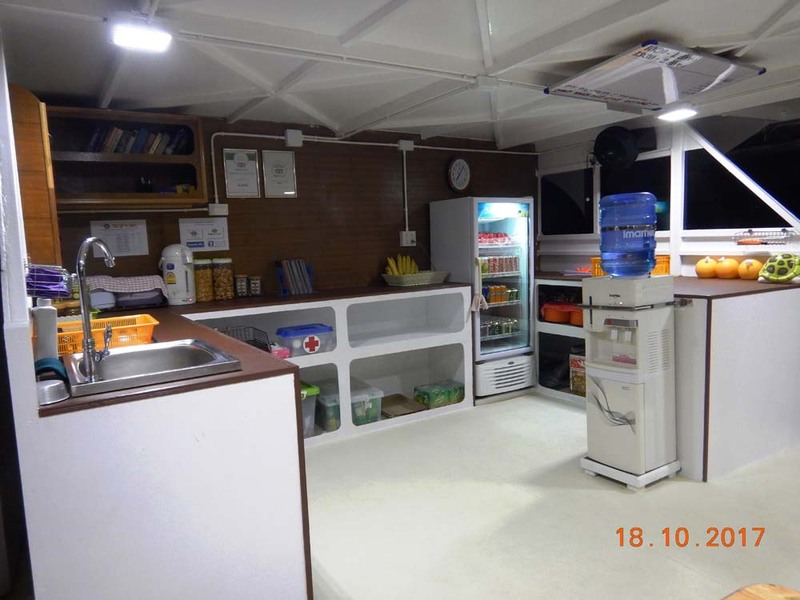 MV Nemo 1 is a great place to take part in a diving course. The Advanced Open Water (AOW) course is by far the most popular, as it allows you to become fully immersed in the divers’ environment. It involves very little theory, but lots of great diving. 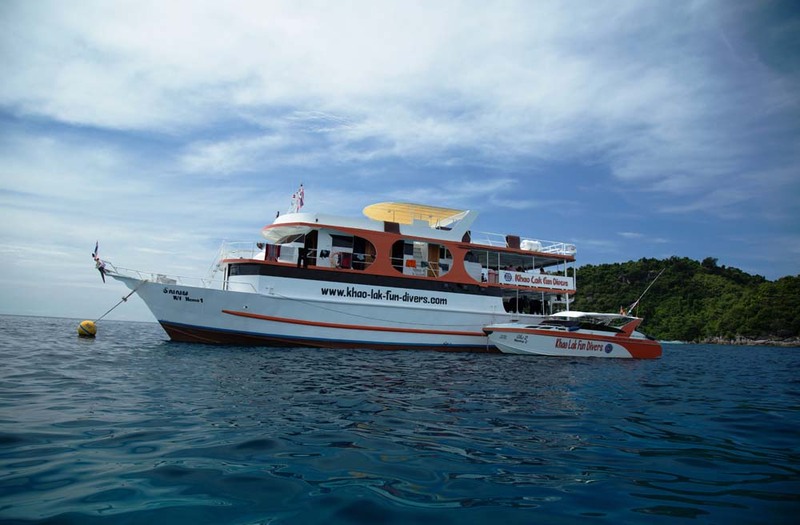 Nitrox, Adventure Deep are other courses which are popular on Similan liveaboard trips. 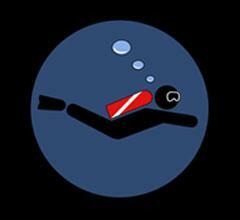 Some people even decide to try diving or learn and become certified. Please contact us for details and the most competitive quote. 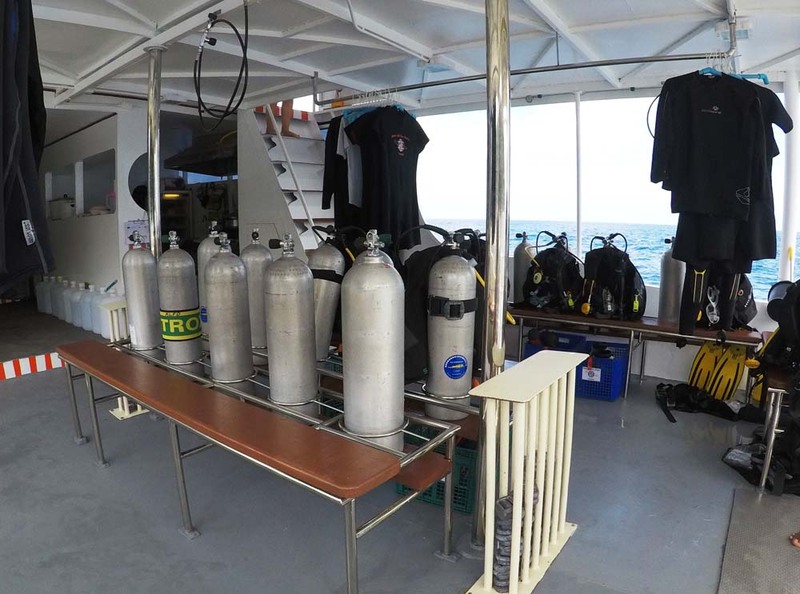 Anyone wanting to take part in a diving course on MV Nemo need to let us know in advance, so that we can prepare the best instructor and materials for each customer. 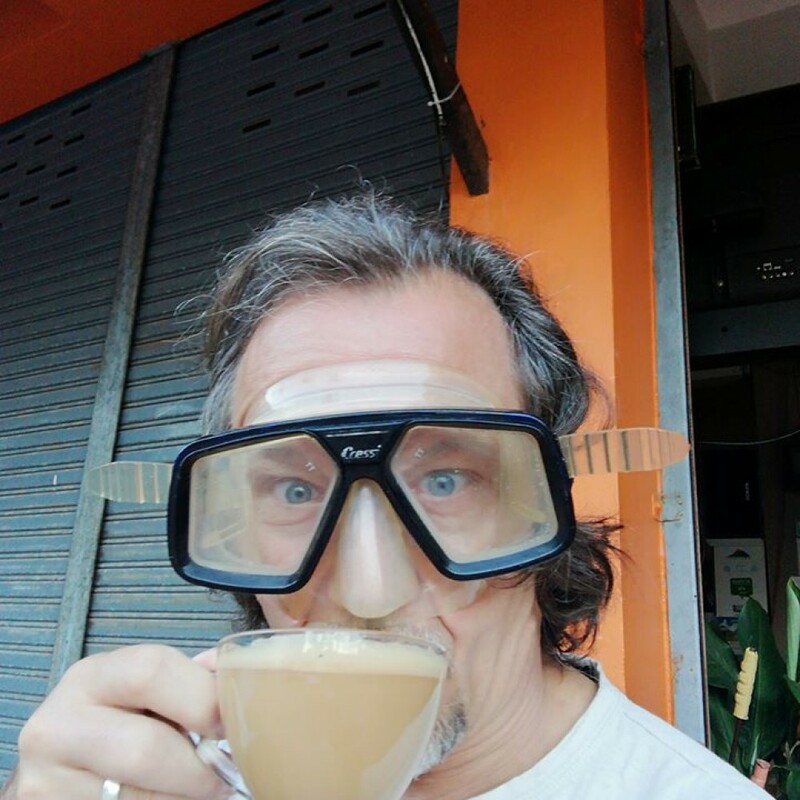 In addition, those who want to learn to dive by taking part in a PADI Open Water Diver course really need to spend at least a two full days on land in Khao Lak prior to boarding the boat. This time is spent learning and reviewing the theory and practical diving skills. 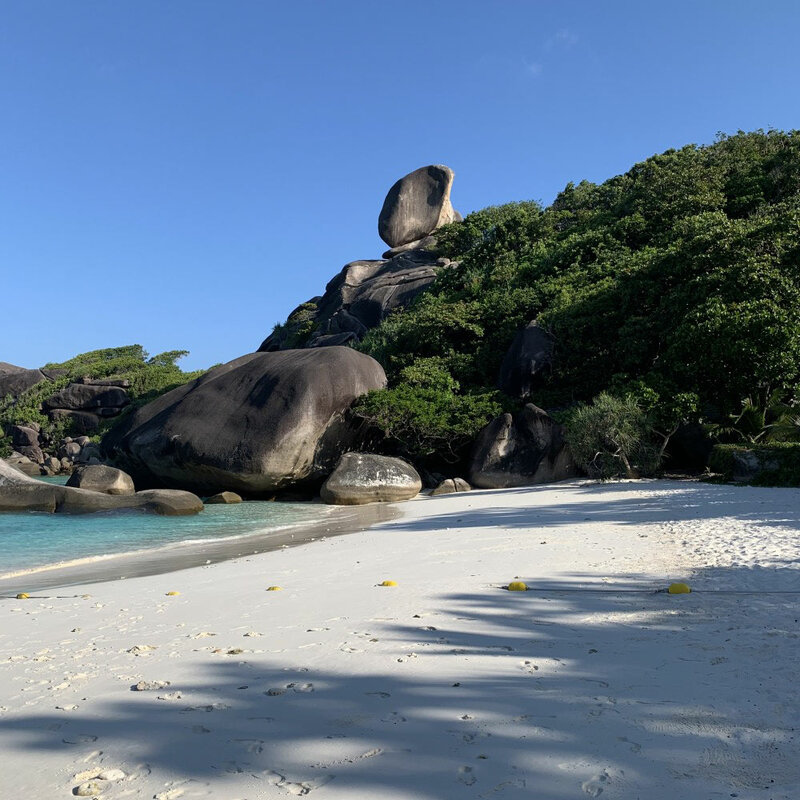 Other dive centres are more flexible or allow less preparation time for Open Water courses, but the staff and crew of MV Nemo want divers to be absolutely prepared before jumping the deep clear seas of the Similan Islands. Free pick up and drop off is available for Nemo guests in the Khao Lak area. 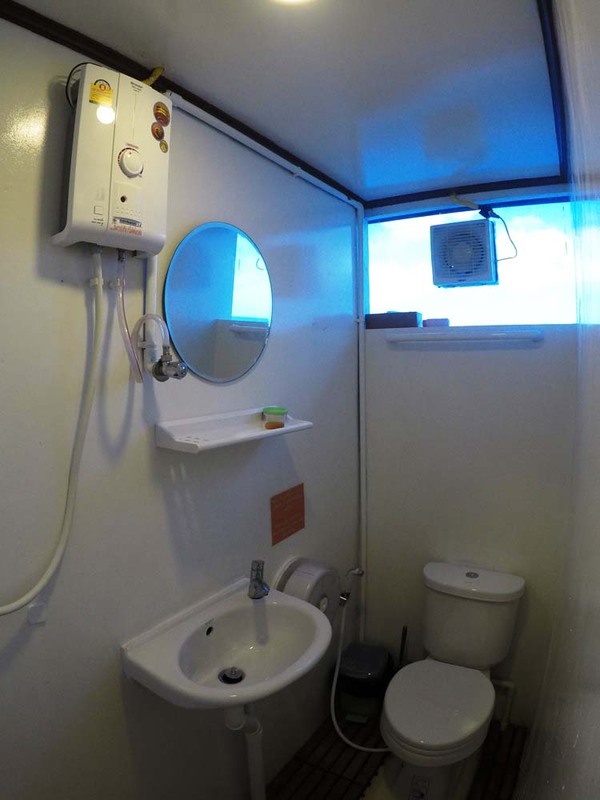 Those coming from too far north of Khao Lak can be picked up and dropped off for a small charge. 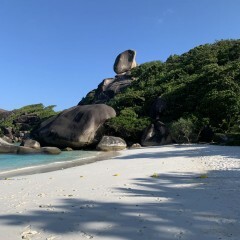 It is not practical for guests from Phuket. This journey is long and expensive for morning departures, so we strongly recommend guests stay in Khao Lak the night before the trip. To be fair to all guest on Nemo, the pick up vehicle is unable to wait for late guests! 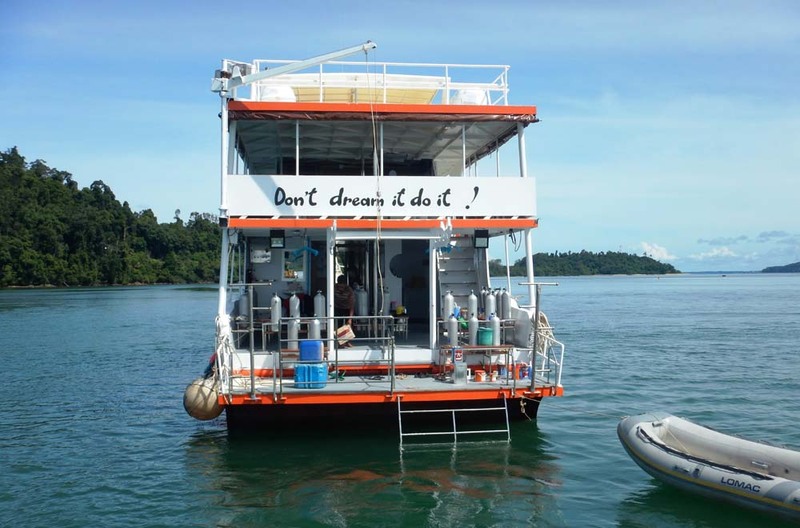 Transfers to the speedboat and then to the diving ship must be on time. Please do not be late for your Nemo morning pick up! That was my first liveaboard and I must say you set the bar pretty high. Thank you for this beautiful adventure! I had the Best 2 days on the Nemo 1, with a lot of great dives, and Nice diving intructors. All off the staff was very sweet and helpfull, and the food was tasty. 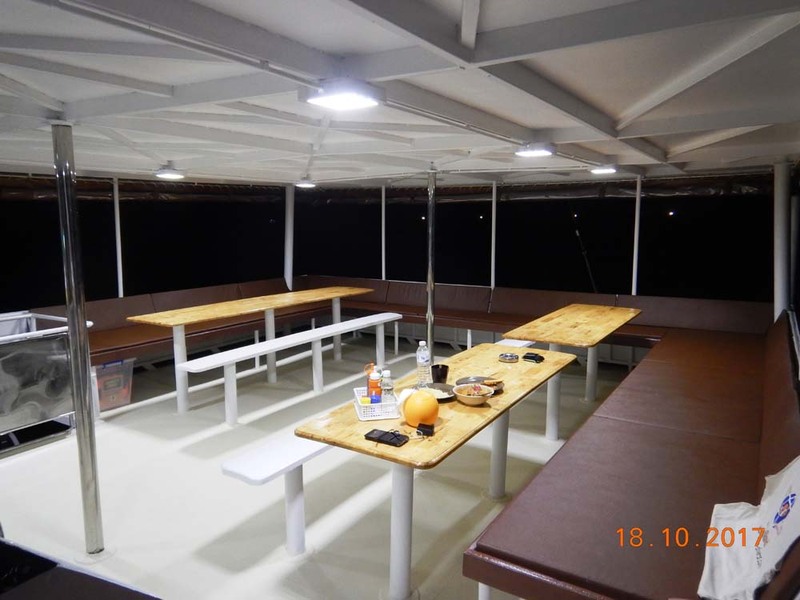 Also the boat has a Nice atmoshere, and since we where not Many on the boat at a time, it was Nice and relaxing. Would recommend this trip to everyone. Had an amazing time diving with the guys and gals on Nemo 1. Saw a baby whale shark which was the highlight of my trip. The food was great and the crew were awesome. A Wonderful trip, professionally organized and smoothly running. We had a lot of fun and experienced Wonderful Things, encountering Sharks, turtles, baracudas and much much more. Absolut highlight was, when my guide Jürgen and me had a close Encounter with a Beautiful, large Marlin! 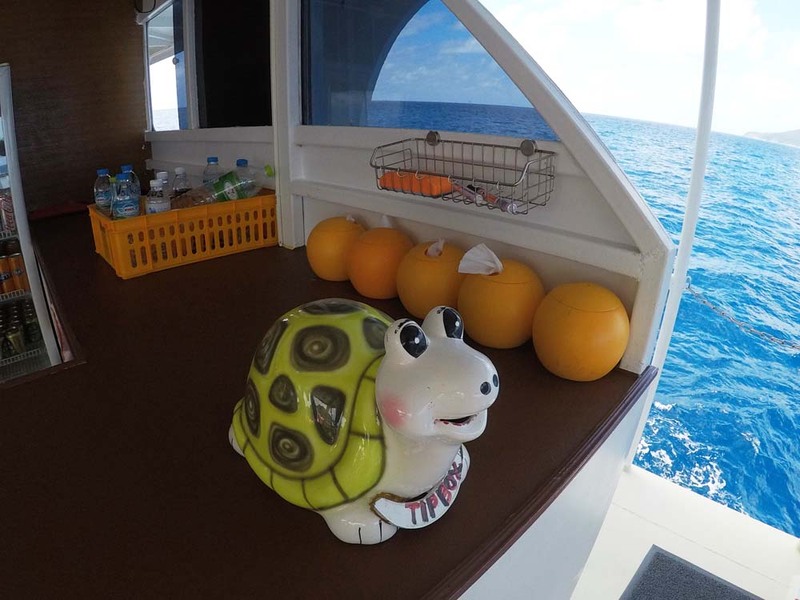 It was our first liveaboard trip and we had a really good time on board. The food was so delicous and always a new surprise. 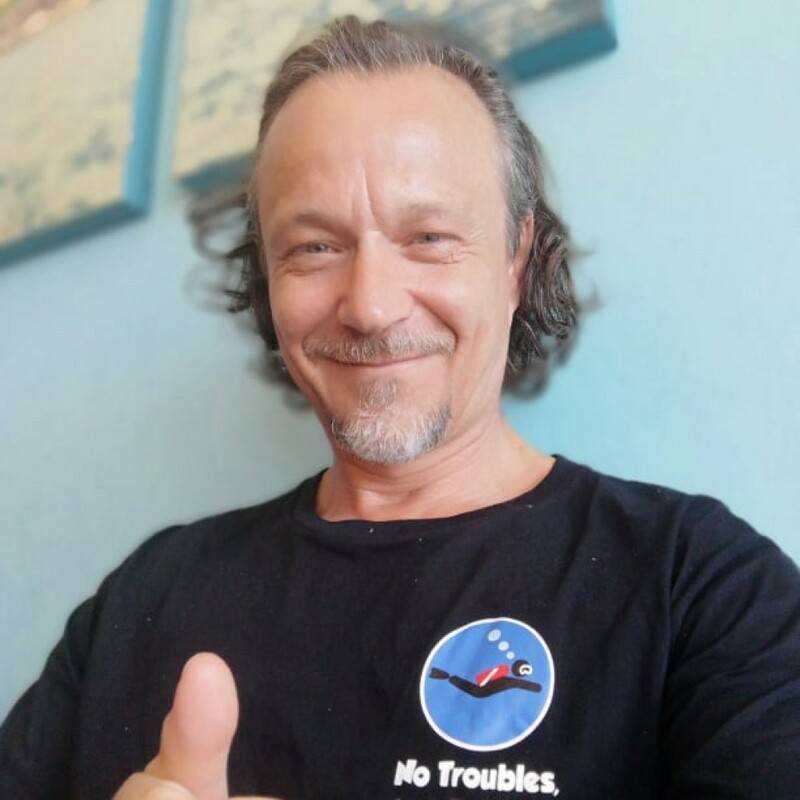 A special thank you to Alex for the amazing dives and to Jamie which helped us a lot to organize our trip. A very warm thank you also to the crew which was always there to support and help you. 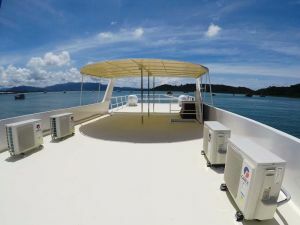 I really liked the fact that the Liveaboard boat already is on location and that you are brought to the boat by speedboat. 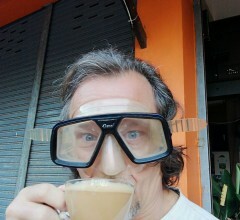 Service is excellent on board with enthusiastic dive crew and Thai boat crew. Groups were well formed along experience and enthusiasm. Will certainly come back, plenty I have not seen yet. Included - All meals, fruit, hot & cold drinks, Divemaster guide services, weights & belts, transfers from local resorts, speedboat transport to MV Nemo 1, air-conditioned accommodation on board, and limited accident insurance. 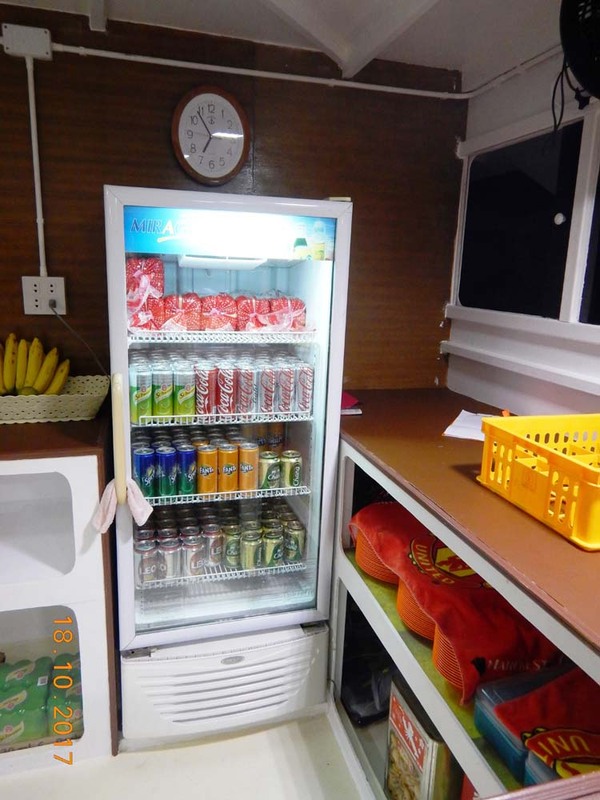 Not included – National Marine Park fees, diving equipment rental (if required), soft & alcoholic drinks, pickups and drop offs from outside the local zone. 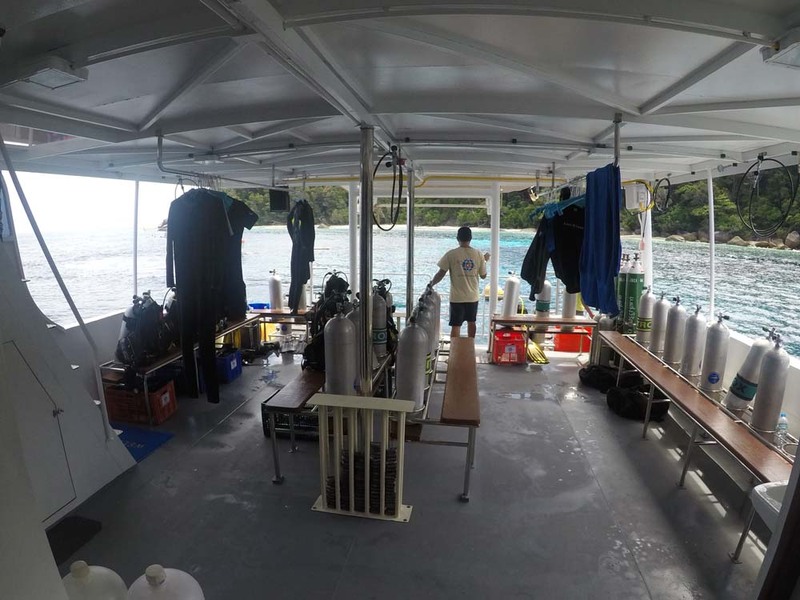 Equipment rental is 600 THB / diving day, plus 300 THB for a dive computer (if required). National Park fees are 900 THB for 2D/1N trips, 1,100 THB for 3D/2N trips, and 1,300 THB for 4D/3N trips. Any extra days are 200 THB more per day. Please contact us for other 'extras' such as partial equipment, long wetsuits, etc. Most are available, and at very competitive rates. Overnight guests must dive with a computer at all times.